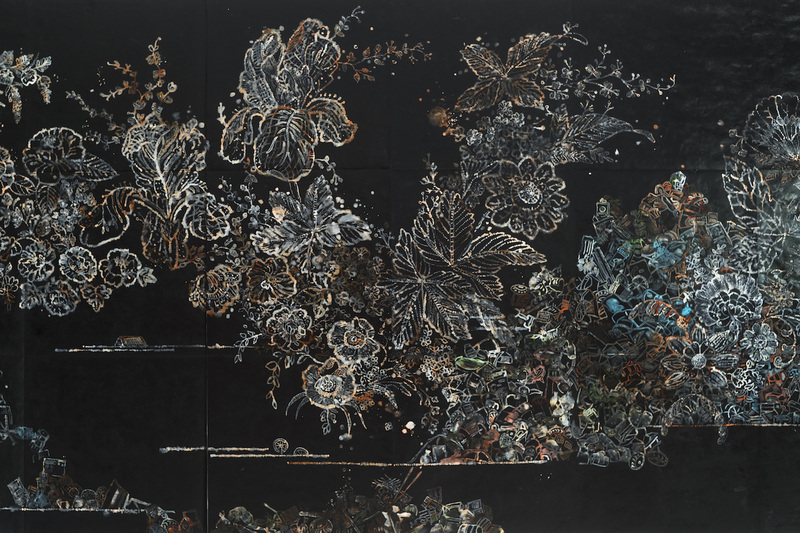 Nancy Friedemann- Sánchez has had exhibitions at the Museum of Contemporary Art in Miami, Florida, Blue Star Contemporary in San Antonio, Texas; the Bemis Center for Contemporary Arts in Omaha, Nebraska; The Joslyn Art Museum, The Portland Museum of Art; The Museum of the University of New Mexico, El Museo del Barrio; El Museo del Arte de Puerto Rico, University at Albany Art Museum, Biblioteca Luis Angel Arango, Bogotá; San Luis Obispo Art Center and Bronx Museum of the Arts among others. The artist also was selected for the Elisabeth Sackler Feminist Art Base at the Brooklyn Museum. Friedemann- Sánchez has been awarded a Nebraska Artist Achievement Award, a Smithsonian Artist Fellowship, a Puffin Foundation grant, a Pollock Krasner grant, a National Association of Latino Arts and Culture grant and has been nominated to the Rema Hort Mann and to the Anonymous was a Woman Foundation. She has also received an achievement award from the Nebraska Arts Council. She has been invited to be a resident at Art OMI, Fountainhead, Tamarind Institute, Yaddo, Gasworks Tiangle Arts, Bemis Center for Contemporary Arts and Bronx Museum for the Arts. Currently she is creating a visual novel comprised of paintings, sculptures and mixed media that together and in different voices weave a synchronicity of dialogues, passages, punctuations, and silences about hybridity and cultural ownership. It is a multi-narrative novel about cultural memory, migration and the pursuit of the American dream. These images are anchored in Minimalism as a dominant ideological umbrella. They are then intertwined, intersected, to make narratives that describe lives of spiritual and physical transit. Anchored in feminism, her art is informed by North and South American cultural forms that fuse and cross-pollinate. Her practice is a bicultural and trans-cultural experience; it speaks of difference, of opposites. Having grown up in Colombia and having migrated to the US as an adult she makes art in two languages about the curious and intense experience of physically having moved, yet having a piece of herself remaining rooted in Colombia. Nancy Friedemann- Sánchez creates visual expressions about the hybridity and syncretism that has taken place since the conquest of the Americas and that gets replicated in the migration experience.